The teenager's career is being played out back to front because of Sarri's reluctance to incorporate the gifted attacker into his tactical framework at Chelsea. And on the evidence of his performance on the pitch in the 5-1 win in Montenegro and his strong, mature, measured response after the game when questioned about the disgraceful racist abuse suffered by England's players, he is an all-round class act and will be for years to come. He is getting his chance, the show of faith in his talent, from England. This is a youngster with two England caps to his name before he has made a Premier League start for Chelsea - a stark statistic that does not reflect well on Sarri. Chelsea's fans have become increasingly mystified by Hudson-Odoi's continued marginalisation and the temperature on those feelings will only have been turned up several notches by the maturity of his performance here in the hothouse of Podgorica, where natural passion boiled over into shameful incidents of racist chanting aimed at England's players. Hudson-Odoi was not only one of England's stand-out performers, helped by Southgate's successful early switch from right to left, he showed character beyond his years in this unforgiving, unpleasant atmosphere. What does a future England player look like? He was composed amid the acrimony from the terraces, picking up an object thrown from the crowd in the aftermath of Raheem Sterling's goal before getting back to the business of ensuring England recorded another dominant win after Friday's 5-0 dismissal of the Czech Republic at Wembley. The winger is seriously considering following his England team-mate Jadon Sancho's route to the Bundesliga. Sancho, who celebrated his 19th birthday on Monday, has been a huge success since leaving Manchester City for Borussia Dortmund. It cleared a pathway to the England team for Sancho and now Bayern Munich are willing to pay well in excess of £30m to take Hudson-Odoi, whose contract expires at the end of next season. Hudson-Odoi showed he has the temperament and talent for England and yet he still seems to have to prove himself to Sarri. It is a situation that gives a clearer insight into the Italian manager than it does to Hudson-Odoi. It would be gross negligence on Chelsea's part to let a young player of such promise go and it may well be that Sarri's departure will be their best chance of keeping him. Hudson-Odoi will be coveted by many clubs and if he is not valued by his own manager then he clearly has the strength of character and self-belief to take his chances elsewhere. He made a difficult start in Podgorica, occasionally running into blind alleys and showing a weakness in an aerial challenge in the build-up to Montenegro's opener from Marko Vesovic. Southgate acted with that switch of flank and suddenly Hudson-Odoi was released. He cut inside and his shot across goal was turned in by Ross Barkley, then a magical slalom run in the second half brought a fine low save from Montenegro keeper Danijel Petkovic. His performance was full of menace, ironically proving to be exactly the sort of player a Chelsea side that occasionally lacks threat requires. If Chelsea are to show they are a club where young talent can fashion a career then Hudson-Odoi should be their poster boy, not the one who got away. Southgate has embraced him in the England fold and barring unforeseen circumstances he is there to stay, part of an emerging young group that is bringing verve and excitement to the national side. "It was a fabulous performance," his manager said. "He showed what we have been seeing all week. His application has been excellent." The pressure on Sarri to play Hudson-Odoi will only increase when he performs as he did for England and the teenager's desire for action at the elite level will only be sharpened by his international experiences. Chelsea's only benefit, should they fail to persuade him to stay, will be that his price will increase as he gets the wider exposure. The Stamford Bridge club must make it top priority to ensure it does not come to that. Sarri must come to his senses and follow Southgate's template, stop holding this untamed talent back. 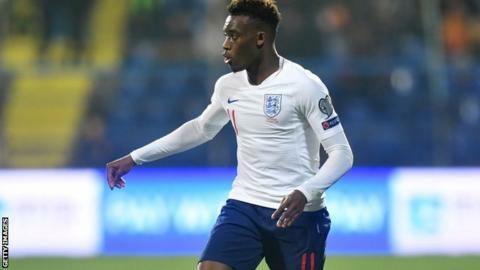 If Hudson-Odoi feels under-used and under-appreciated (although not by Chelsea's fans), there is no danger he will suffer similar disappointment with Southgate's England.